Murder by Gaslight: Professional Poisoners. Dr. and Mrs. Henry Meyer used a dazzling array of aliases to stay one step ahead of detectives as they moved from city to city engaging in lethal insurance fraud. It was their livelihood; they were professional poisoners. On July 12, 1893, New York Police detectives Trainor and Von Gerichten concluded a fifteen-month investigation with the arrest, in Detroit, of Dr. Henry Meyer and his wife Maria for the murder of Gustave Baum. It had been a case of insurance fraud; the couple had taken out several policies against Baum’s life in New York and when Baum suddenly died they tried to collect. Two insurance companies paid without questions, but Mutual Life Insurance Company had suspicions. They began to investigate, prompting the Meyers to take what they could and flee New York. Gustave Baum had been a willing co-conspirator in the insurance fraud. Meyer had met Baum, whose real name was Ludwig Brant, in Joliet Prison in Chicago. After their release, they regrouped in New York along with with Maria Meyer, and a third prisoner, Carl Muller, alias August Wimmers, and they worked out a scheme where Maria Meyer, using the alias Emilie Rathier, became Baum’s bride in a mock marriage ceremony and Baum took out several life insurance policies with Emilie as beneficiary. Then with Dr. Meyer’s help, Baum was to feign sickness. When it appeared that Baum was on his deathbed, they planned to procure a corpse, say it was Baum, and collect on the policies. Meyer, who was calling himself Dr. Henry Reuter, prescribed medicine which Baum believed would make him appear sick but would do no lasting damage. But the Meyers had no intention of splitting the take with Baum, and they saw no point in looking for a corpse when it was so much easier to create their own. To facilitate Baum’s fake illness, they kept him under the influence of opiates. As Maria appeared to lovingly nurse him, she fed him the poison that would eventually kill him. It is not clear whether Carl Muller was in on this part of the plan. 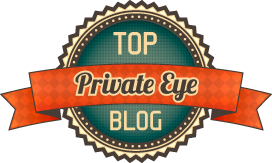 When Gustave Baum died on March 30, 1892, Dr. Simon Minden was called in, and when “Dr. Reuter” detailed the symptoms for him Minden agreed that Baum had died from chronic dysentery. Even before the body was buried, Maria went to the offices of Washington Life and New York Life insurance companies and collected payments. But Mr. Gillette of Mutual Life Insurance refused. He had listened to gossip neighbors who criticized the widow’s lack of mourning, and he noted how quickly she and Baum’s doctor had left the neighborhood. It took three months, but suspicion surrounding Baum’s death grew to the point where the coroner agreed to exhume the corpse for further examination. The stomach was given to a chemist who determined that it contained antimony, a strong mineral poison, in a quantity large enough to kill Baum. The hunt for Dr. Meyer and his wife began. At the time of their arrests in Detroit, the New York detectives were not the only ones hot on the Meyers’ trail, detectives from Chicago and Toledo were also ready to make arrests. For a time, it appeared that there would be a legal battle to decide who would be taking the poisoners back to their home state. After leaving New York, the Meyers settled in Toledo, where were known as Dr. and Mrs. Hugo Wheler. Shortly after they arrived, Maria gave birth, and they hired a young woman named Mary Neiss as a domestic servant. Maria told Mary that she wanted to purchase some life insurance, but was afraid that since the birth, her health was not sound enough to pass the medical examination. She persuaded Mary to go to Detroit, pose as Mrs. Wheler and purchase an insurance policy. When Mary returned to Toledo with a $5,000 policy from the Equitable Life Assurance Society, the Meyers set to work poisoning her. As Mary’s condition continued to deteriorate, Carl Muller took pity on the poor girl and became infatuated with her. He declared his love and told Mary about the wicked plot against her; the couple fled together to Chicago. Undaunted, the Meyers hired another servant and poisoned her. When they tried to collect the claim, the company investigated and found that the description of the dead woman did not match that of the woman who was insured, and neighbors who has known Mrs. Wehler were positive that the dead woman was not she. The Meyers quickly left for Detroit and the Toledo coroner issued a warrant charging Dr. and Mrs. Meyer, alias Wehler, with the murder of an unknown woman. Pinkerton detectives were also after Dr. Meyer for insurance fraud in Chicago. Chicago is where Dr. Meyer began his career as a poisoner. 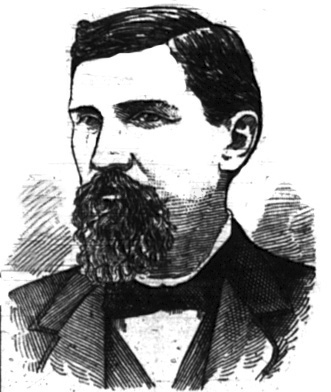 After graduating from the Chicago Homeopathic school in 1878 he set up an office on Sedgwick Street and became the family physician of Henry Gelderman, a well-to-do grocer. Gelderman’s wife was considerably younger than he was and, although Meyer was already married, he became intimate with Mrs. Gelderman. About a year later, Meyer’s wife died suddenly and shortly after, Henry Gelderman took sick and died. At the time foul play was not suspected, but when Dr. Meyer married Gelderman’s widow, suspicions were aroused. The bodies of Mrs. Meyer and Mr. Gelderman were disinterred, and post-mortem examinations reviled they had both been poisoned. Dr. Meyer and his new wife were arrested, but evidence was not sufficient for conviction. Not long after this, the Geldermans’ young daughter drowned in the bathtub and Dr. Meyer attempted to poison his second wife. She refused to testify against him and the charges were dropped, but when she caught him having intimate relations with their domestic servant she sued for divorce. Dr. Meyer eventually met and married Mary Dressen, a woman with a passion for poisoning equal to his own. It was estimated that they committed at least six insurance murders together before their arrests. After the arrests in Detroit, it was agreed that since the New York detectives found him first they should take him to trial in New York. However, the Toledo detectives requested that, should Dr. Meyer be acquitted in New York, he was to be held for them. Much of the prosecution’s case against Dr. Meyer consisted of expert testimony explaining what was found in the stomach of Gustave Baum and what effects it would have. The star witness, however, was Carl Muller, now married to Mary Neiss, who had come to New York at his own expense to testify against Meyer. On the witness stand he explained the insurance fraud plot where Baum was to feign illness. They ran into trouble, he said, when Dr. Meyer had been unable to secure a corpse to replace Baum. Muller had suggested that they abandon the plan and leave town, but Maria Meyer felt that it was easier just to kill Baum. Meyer’s defense consisted of testimony from expert witnesses who explained that it was quite possible that someone had added the antimony to Baum’s stomach after his death. Meyer’s attorney, Charles W. Brooke, questioned only four witnesses saying that there was no need for more testimony since the prosecution had failed to show that Dr. Meyer killed Baum. It was a bold move, but it would not be tested in this trial. As Brooke was giving his closing statement and was in the process of vehemently condemning the testimony of Carl Muller, one of jurymen, A. B. Low, began to shake and twitch uncontrollably. Low had to be carried out of the courtroom and he began shouting and frantically making Masonic hand signals. One of the doctors at the scene assessed Low’s condition as cerebral congestion and Low was taken to Bellevue Hospital for examination. The trial was postponed and two days later the doctors at Bellevue pronounced Low insane. The judge declared a mistrial. Dr. Meyer’s second trial the following April took much the same course as the first one. The defense witnesses were primarily doctors who testified that there was no way to tell if the poison was given to Baum after his death. 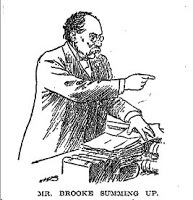 In his closing argument, Brooke attacked the motives and credibility of Carl Muller. 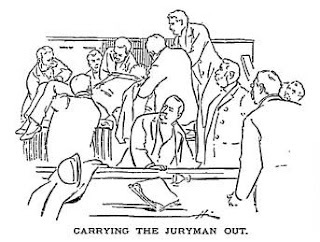 While Brooke did not generate enough doubt to win an acquittal from the jury, he did manage to save Meyer from the state’s newly installed electric chair. After fifteen hours of deliberation, the jury returned a verdict of second-degree murder. Dr. Meyer was sentenced to life in Sing Sing prison. Maria Meyer was never prosecuted for her role in the crime. “Charged with Many Murders,” Daily Inter Ocean, July 14, 1893. “Dr. 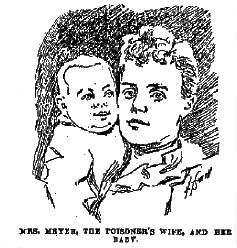 Meyer in Sing Sing,” New York Herald, June 9, 1894. “Dr. Meyer Killed His Partner in Crime for His Life Insurance,” Cincinnati Tribune, February 16, 1896. “An Expert Murderer,” Daily Inter Ocean, July 14, 1893. “The Insurance Swindle,” Worcester Daily Spy, December 9, 1893. “Juryman Low's Mind Unbalanced,” New York Herald, December 19, 1893. “Long-Sought Murderer Arrested,” Fitchburg Sentinel, July 13, 1893. “Meyer Gets A New Trial,” New York Tribune, December 22, 1893. “Meyer May Break down to-Morrow,” New York Herald, December 17, 1893. “Meyer's Defense Was Soon Closed,” New York Herald, December 16, 1893. “Poisoned For Insurance,” Syracuse Evening Herald, July 13, 1893. 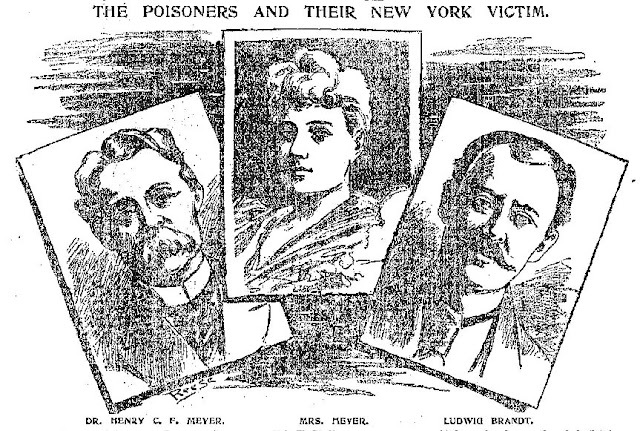 “A Poisoner's Crimes,” New York World, July 16, 1893. “Professional Poisoners,” Owyhee Avalanche, January 6, 1894. “A Sigh of Relief,” Worcester Daily Spy, May 19, 1894. “The Trial Of Dr. Meyer Postponed,” New York Tribune, December 20, 1893. Wow truth is stranger than fiction! Diabolical material for a mini series. A Duel in the Bedroom.